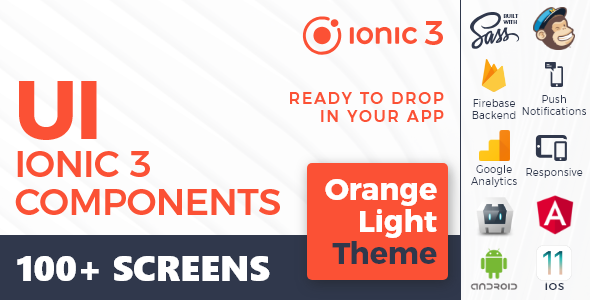 Ionic 3/Angular 6 Orange Light is a multipurpose app template that anyone can use to create an app for almost anything. This app starter is the embodiment of the saying “Less is more”, as we built a minimalist and feature-rich Ionic app template, which will blow your mind once you get acquainted with its features. Considering the fact that this app starter is built using Ionic, a hybrid mobile app development framework, apps you build with it will run on multiple platforms. With more than 80 layouts, you will be able to obtain a complete look for your app, without the need of spending numerous hours drawing your own elements. Ionic 3/Angular 6 Orange Light Theme/Template App includes everything you need to build both beautiful and functional Ionic app. Below is the full list of features included in this app template, so be sure to check them out before you make a purchase. Firebase is a powerful tool owned by Google which enables developers to build collaborative apps without the hassle of managing servers of writing server-side code. If you would like to build Firebase-powered Ionic app, then this is the template for you. Nowadays, CSS preprocessors are a standard for web development. One of the main perks of preprocessors is that they enable you to use variables. This circumvents the need for copying and pasting code, and simplifies development. Sass is one of the most popular preprocessor languages developed 11 years ago by Hampton Catlin. It adds some features that do not exist in pure CSS, such as mixins, nesting selectors, inheritance, variables etc. MailChimp is the biggest email marketing provider that offers a generous free plan. Our app starter provides MailChimp integration that can help you in collecting leads for your e-mail campaigns and track results. You just need to change the ID of your MailChimp list and you’re done. Form validation (to be more precise – form field validation) forces the user to fill out all the required fields in the correct format. Setting up form validation form scratch is a tedious chore, but with our app starter you can avoid it. Push notifications are a direct and convenient way to connect with the users of your app. Push notifications can promote products, remind users to use the app, and even drive users to other marketing channels like social networks. With our template, you will be able to effortlessly send push notifications, over Firebase. All Ionic app starters crafted by Creative Form (including this one) are built to suit a wide range of device sizes. All screens in Ionic 3/Angular 6 Orange Light template app are made responsive over Split Pane component. Additionally, ion-grid (heavily influenced by Bootstrap’s grid system) is included in each component. Google Analytics is extremely useful because it offers detailed information about every single thing users do while using the app. Each screen of Ionic 3/Angular 6 Orange Light UI Theme is set up with Google Analytics. Considering Google Maps integration, our theme contains 3 layouts with Google Maps API component (Location details, About us and Full screen view). We enabled Satellite and Map functions, as well as Street View browsing. Our team consists of experts with years of experience, so every issue you can’t resolve following our detailed documentation, will be resolved by them within a reasonable timeframe. In addition to great customer support, Ionic 3/Angular 6 Orange Light provides free update. 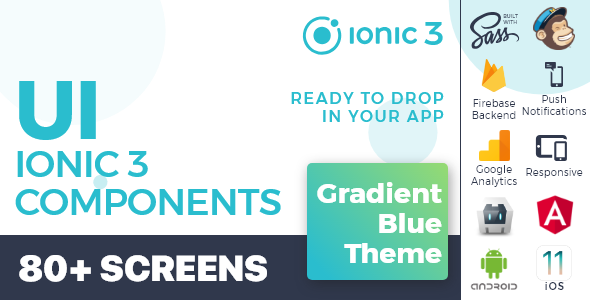 We are following the official Ionic updates, so every future update of this template will be at your disposal after you purchase the license. What makes our Ionic 3/Angular 6 Orange Light app starter so pleasing to the eye? The importance of good design is beyond having something that looks nice, it is about creating a pleasant UX from beginning to end, and that is exactly what you will achieve by using our app starter. Icons play a major role in design. We included a wide range of 800+ icons from including default Ionic icons. Just pick the right ones and integrate them into your app. We made several blend modes so every image in the app will look great, which will boost the aesthetic side of your app. All fonts used in this app starter are free, and from Google Fonts library. Nevertheless, if you want to use some other fonts, you can easily replace the existing ones in just one line of code in the main SASS file. With the help of animate.css we produce several animated elements that will raise the UX of your mobile app. Colors and color combinations of the Ionic 3/Angular 6 Orange Light Theme are made from the Google color palette and by their guidelines. Building such a comprehensive app starter like this one is not an easy endeavor. In order to be able to make all the components we considered necessary, we had to seek help from several technologies and open source projects. If you are a developer, you have probably used some of these technologies, so this is just a quick overview of their principal characteristics. Sass, also known as CSS with superpowers, is a CSS preprocessor which adds special features which are not available in CSS, like variables, mixins, nested rules, inheritance etc. First appearing in 2007, Sass was designed by Hampton Catlin and developed by Natalie Weizenbaum, Sass is extremely useful as it adds advanced functionalities and mitigates the repetitive nature of CSS. Made by Ola Christensson, Elastic header with zoom represents Ionic/Angular directive for elastic headers. Animate.css is a fantastic little CSS library that has been around for a while, and is used to create really nice animation effects using just CSS. It eliminates the need for creating custom animations, we can just import the library and use it.